“We were pleased with the installation process which had the machine running the same day as delivery”. Specially designed machine, wiring and extraction. Full project management delivered seamless transition from design to installation. 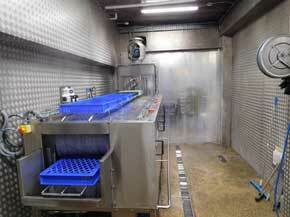 Design, supply and installation of a Trayline 2 wash and rinse machine. Operation and maintenance training to ensure maximum efficiency and longevity of machine. Planned and reactive maintenance service. 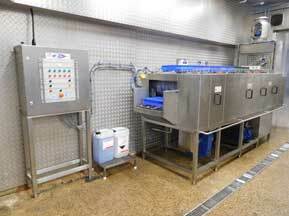 Full detergent package including a dosing system, chemical supply and regular inspection visits. Machine can be pulled away from the wall by pallet truck for maintenance. The installation of an Oliver Douglas Trayline 2 to Hertfordshire’s family bakers Simmons has enhanced their production facility. Simmons runs a 24/7 operation to keep their shops supplied. They currently have 35 shops, all within a 25 mile radius of their bakery to ensure the freshness of the bread & rolls, cakes & pastries, cream cakes, pies & tarts and tray bakes. The machine is designed to be operated by one person. Trays are loaded by placing them base down one at a time for movement along the roof of the machine, at the end of which they are inverted as they turn and are taken up by the conveyor. This automatically feeds them in a controlled manner through the wash chamber with washed and rinsed crates then delivered back to the same operator. In line with the site limitations, the machine requires only a small footprint. Capable of handling up to 200 crates per hour, it has been configured to accommodate the specific Simmons crate dimensions and design. Paul Careless, Sales Manager at Newsmith Stainless, worked closely with Rupert Matthews, Managing Director of Simmons Bakers, to ensure that the machine, wiring and extraction were all bespoke to suit the facility and maintenance requirements. “It was really satisfying to hear the customer say, “Wow that’s fantastic!” as they saw the level of dryness and cleanliness as the first few trays came out of our machine during our commissioning. They hadn’t been used to that with their previous unit” Paul Careless concludes.